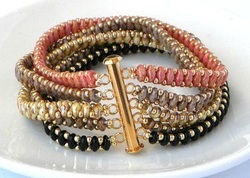 Other Fun Stuff - Bead It! This is a really easy technique with a great outcome that is unique! Chain, seed beads, waxed linen and a button are all you need. 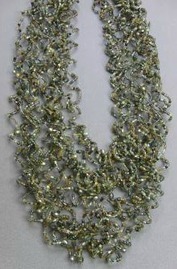 Learn to make beaded fringe with 4mm Swarovski crystals and size 11/0 seed beads on a base of size 6/0 seed beads. You can't tell from this picture how blindingly beautiful this bracelet is! This is an awesome project for leftover beads! Using seed beads of different shapes and colors, and maybe some crystals or pearls thrown in, you will string and string beads, then learn to curl the 49-strand beading wire to create a full and stunning necklace! Create this light and airy necklace with freshwater pearls, crystals, or whatever! Great for weddings, parties, or every day. 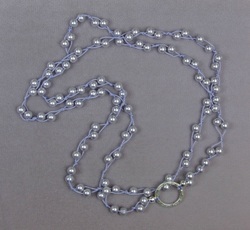 This is a relatively easy technique using just pearls or other beads and silk or other stringing material. Make it long and it can be either a necklace or a wrap bracelet! 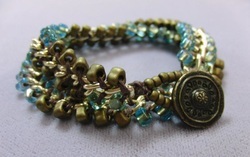 Learn to crimp while creating this boho bracelet with two-hole Superduo beads. Bring a Russian spiral to fringe! Using size 11/0 seed beads and some sort of crystal, pearl, or whatev', wind your way to the coolest fringe! Top Photo: Using Superduos and 8/0 seed beads, this wrap works up quickly and easily, you'll want to make them for all of your friends! Bottom Photo: Using Superduos, 3x2mm crystal rondelles, and 11/0 and 15/0 seeds, create a fancier version of the wrap!